To select a mirror to adjust, turn the switch. To adjust the mirror, move the switch. 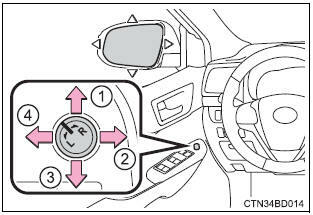 Push the mirror back in the direction of the vehicle�s rear. 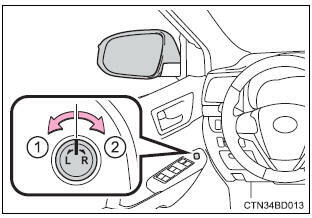 Vehicles without a smart key system the engine switch is in the "acc" or "on" position. vehicles with a smart key system the engine switch is in accessory or ignition on mode. A desired mirror face angle can be entered to memory and recalled automatically by the driving position memory. Do not adjust the mirrors while driving. Do not drive with the mirrors folded. 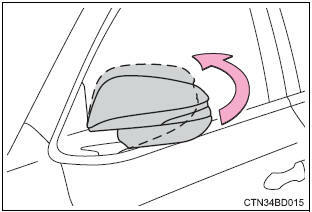 Both the driver and passenger side mirrors must be extended and properly adjusted before driving.